Todays painting is of an unoccupied house/buisness on Gratiot. I hesitate to say abandoned because it seems in good enough shape, but lord knows the last time an actual business operated out of there. 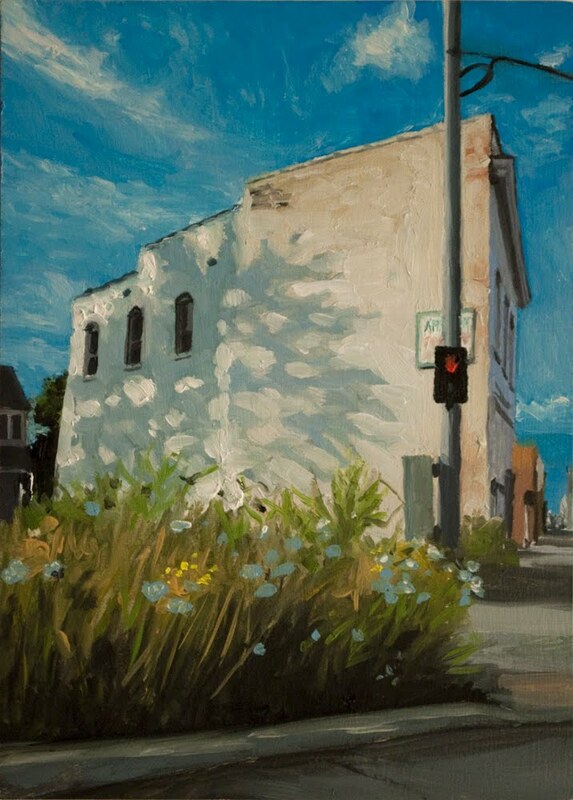 I liked the wild flowers and weeds growing like crazy off the street and the shadows and disappearing view down Gratiot. Glad to see you are back painting again. When you were on vacation, I got worried that maybe you gave up on your "painting a day" goal! Question for you.... do you have a fascintation about street posts? I notice that they show up in subjects in many of your compositions. The one in this work is particularly nice, but why is it obstucting what is probably a cool sign on the side of the building? I live near Ann Arbor, and yesterday I drove to Detroit yesterday and several several street scenes that made me thing, "oh, Andrew would dig this". I especially like the church on Rosa Parks highway exit ramp to the Lodge that has the painting on the side of it's wall (near old Tiger Stadium). Also, just as feedback from a fan of your work, I find your city scenes more interesting than your nature landscapes. I get it that you have to paint what inspires you, so definitely not a criticism... just encouragement to keep exploring old buildings and such.